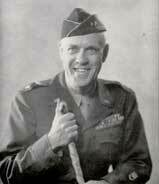 Born and raised in Indiana, Paul entered West Point in June of 1907 with a Bachelor of Science already to his credit. Upon graduation in 1911 he was commissioned as a 2nd lieutenant and awarded degrees of B.A. and A.B. Then began the commissioned service of nearly 40 years. The new lieutenant joined the 11th Infantry at Fort D. A. Russel in Wyoming. To Texas City with the regiment on Border Patrol until August 1914. Then to the 8th Infantry in the Philippines for 3 years and then to the 54th Infantry at Chickamaugua, Park, Georgia. As a new major, he sailed for France with the advance party of the 81st Division and was quickly in action. With the 322nd Infantry in the occupancy of the St. Die Sector, the Vosges and on to Verdun. He fought as a Lieutenant Colonel in the bitter actions east of the Somedian Sector and in the Meuse Argonne. After returning home with his regiment in June 1919 he spent four years at various schools, four years in the office of the Chief of Infantry, Graduated from the Army War College, four years duty at the USMA then two years with the 29th Infantry at Fort Benning. After several more assignments he received his first star in July 1941. July 1942 he was Assistant Commander of the 35th Division Guarding the southern California coast. A major general in July 1943 and in command of the division, he moved it from San Luis Obispo to Camp Rucker, Alabama and in November '43, through the Tennessee maneuvers and then to Camp Butner, N.C. until May '44. The division landed on Omaha Beach on July 8th, '44 to join the Battle of Normandy under the XIX Corps, First Army. General Baade led the division in almost constant combat for 11 months and 1600 miles, through St. Lo, the Vire River, Mortain, Orleans, Montargis, Troy, Nancy, Sareguemines, the Bleis river, Bastogne, the lower Vosges, the Roer River, Venlo, Wesel, the Ruhr, and on to the Elbe river. This included five countries, France, Luxembourg, Belgium, The Netherlands and Germany. On occupation duty in Hanover and Recklenhausen and the Coblenz area until July 1945, when control was relinquished to the French. The division came home in September 1945, and demobilized at Camp Breckenridge, N.C. The General continued to serve until his retirement, disability in the line of duty, 30th September 1946. Among the numerous decorations he received were the Distinguished Service Medal, two Silver Stars, The Legion of Merit, three Bronze Stars, and Purple Heart. From France he received the honors of Officer of the Legion of Honor and the Croix de Guerre and from the Netherlands, Grand Officer Orange van Nassau. He retired to his home in Santa Barbara, California with his wife Margaret. The general was active in civic and church activities until his death on the 9th October, 1959. 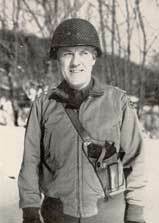 Commanding General Paul Baade during the Battle of the Bulge. Click to zoom in for a better view. Commanding General Paul Baade portrait. Click on the photo to zoom in. Click here to see photos of Commanding General Baade's executive staff.